Okay, this deserves a thread of its own given the sheer amount of new information (though many are just fun facts/tidbits that you may not care about). Edited by Fulmine, 12 February 2019 - 03:43 AM. Those are some weird blood types. Pre ts Coby was 18 at best when he met Luffy in w7. The one in the first chapters looked 14. I wonder how long was their journey from orange town to the first SA visit. Edited by Abaroxa, 05 September 2018 - 10:38 AM. Skypiea info cards will come out on February next year...damn, Enel-sama please wait for me! Wait, where is that said? Vivre Card confirms that Zoro is the second strongest in the crew and has 'a vice captain-like role'. Law and Usopp are said to have CoO. Shanks's sword is said to be tough enough to withstand magma...eh, so not his CoA's credit at all? CoA useless vs Logia's elements' properties confirmed or what...? Edited by Fulmine, 05 October 2018 - 10:48 PM. The databook says ''if Kid escapes and becomes nakama, it would be reassuring''...WTF? Yeah this databook sounds like fanmade. Could just be a clunky way/translation of saying "He'd be a powerful ally". CoA useless vs Logia's elements' properties confirmed or what...? This has been implied for a while, imo. Luffy's haki didn't stop Katakuri's mochi sticking to him, for example, and Katakuri's haki didn't do anything for the tea JImbei threw to free Luffy. I know but Katakuri's mochi was also in Hardening though so I have always thought CoA cancelled CoA (as far as being an armor, that is. The added hardness and striking strength should remain). Maybe the databook means Akainu was also using the pre-TS equivalence of Hardening when Oda did not think through his CoA yet? The Jinbe one is obvious though since the tea is not from a DF so just like Nami's rain vs Cracker's biscuit, Luffy's Elephant Gun under water and Luffy's CoA vs Prometheus it shouldn't have effect. Shanks's sword is said to be tough enough to withstand magma...eh, so not his CoA's credit at all? I dont get it, why cant it simply be made of different metal / alloy, which simply has a higher melting temperature? I thought it was said to be one of the 21 grade swords. Thus i imagine it is just special, like the kitestu being special by being cursed. I dont see that sentence to have any connection to Shanks at all, i understand it as a simple hype of how good a swords Shanks has. Although i have not found where that is said in the first place, so might be taking ur words too serious here and the "real" text might be far clearer leaning to ur line of thinking. Thus for me as of now while Shanks might be able to defend with haki vs magma (which i believe) with a normal unranked sword even, his real one on itself cannot be melted by it in the first place. BTW at least for me it is clear that his Haki had protected him from the magma damage in MF, since the splash is clearly armored againt in a far greater area than the swords conecting surface has face. Thus the magma fist, if only the sword was the reason for the defense would have simply moved forward and still hit shanks but in contrast it was completely stopped and not only on the connecting face between magma and sword. Shanks/Ray-san and Luffy use haki completely different in defensive mode though. So far we have only seen SHanks use the haki the way Ray-san did (talking about CoA). They "produce" a shield NOT ON their body like Luffy does, but in Ray sans case (when he aims his hand at the elephant) a bit away from their hand/body with a certain area of effect, or in Shanks case around the front face of their sword (look vs akainu and how the magma is redirected, all at a 90°degree, and that goes even for the magma that does NOT connect with the sword). Luffy uses CoA by "simply" coating his body, thus the effect he still feels might be far greater than the one Ray-san feels since there is a smaller distance inbetween. I.e. Ray-san might not be effected at all by the stickyness of Kata, since he does not connect with it in the first place. And fluids where clearly stated to be the weakess of Katas sticky ability so Oda used the eays way out once more, i see little difference between Crocs tangibility being gone when one uses water and Kata stickyness to be gone, for me both r just different applications of how weaknesses of DFs limit their usage. Btw Kata uses CoA just like Luffy does, so the protection CoA provides to him seems lesser than what Rays and Shanks' does, when it comes to be affected by "sideabilties" of DFs. Biggest problem is Oda is inconsistent far too often..... and sometimes forgets how his very own rules should apply, just see how often @captain kidd rightfully rampages about it. Edited by capu, 08 October 2018 - 03:15 PM. Oda never said what grade Shanks's sword belongs to. Just its name, Gryffon. Precisely because the sword itself is unaffected in the first place that it's questionable how much Shanks's CoA actually contributes (against Akainu's DF mastery anw). Saying it just means Shanks would block it either way is literally giving him feat he doesn't have. ...And how many times will you continue not quoting the most important part of my post (the last sentence) then read what you quoted out of context LOL? I never question Shanks's use of CoA. I question how effective it is. And what? CoA lets you hit Logia as if they are solid. So of course the sword would stop the whole fist. If I throw a big chunk of wood at you and you use a staff to block do you ask why the wood didn't phase through? O__O Not to mention Shanks blocked Akainu out of surprise so it's not like Akainu would have known beforehand to manipulate his magma accordingly. Edited by Fulmine, 08 October 2018 - 11:45 PM. 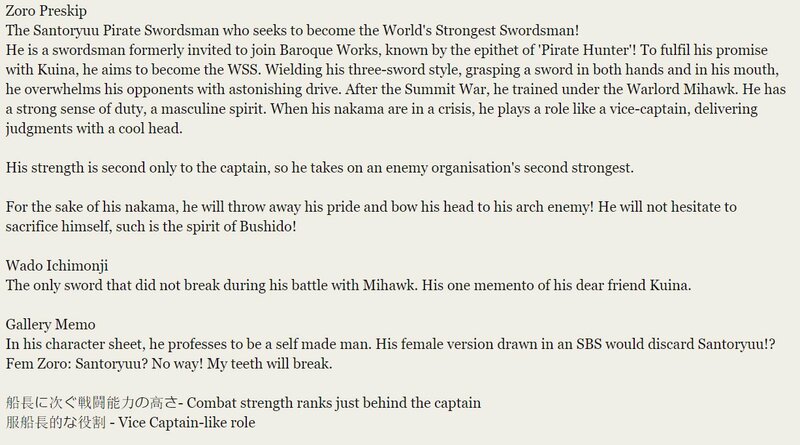 MIght be wrong here, but i think when the swordsranks where once more explained a few chaps ago did Shanks' sword not have been pictured there alongside WBs naginata and Zoros Shuusui (which indeed would still not make it one of the 21, but it would still be one of the ranked ones)? Might have falsely taken a leap here true that, still does not mean that there aint the possibility of the sword itself having special abilities like the ones i proposed. Just like the kitetsus are special by being cursed, Shanks sword might be special by being heat resistant+specially durable and that was the point i was trying to make, which is why i tried to seperate the sword from the user (failed obviously though, should have not talked about Shanks, but imagine preTS Zoro with Shanks sword, sword still untouched by magmas effect, while Zoro is a goner, that was what i wanted to propose at that point). I did say: "which i believe", thus making it clear that it is nothing but an opinion i have, which has not yet been proven or disproven, i think. And how many times will you continue not quoting the most important part of my post (the last sentence) then read what you quoted out of context LOL? U realise that that part is adressed in @Tale 's quote, dont u? U realise that Akainus attacks like the one where he attacks the entire frozen see (meteor shower thing) is also shaped like fists,i dont see why Akainu would not let his element continue the attack beyond the range his arm has, if he has the option of doing so (would be stupid somehow), be he caught of guard or not, his DF is exactly that and "onepiece defined element". Moreover magma aint completely solid, its a mix between fluid metal/elements (because of high temperature) and solid ones. So ur argument with wood is not helping imo since wood is "completely" solid on the outside face (if u discount the water within, which has little effect on its overall solid features, when compared to magma). http://mangaseeonlin...575-page-4.html Here u clearly see that while attacking akainu has "fluid" magma around him far beyond his normal body shape! Once more signifying its fluid+solid characteristics. http://mangaseeonlin...575-page-5.html Not only with Shanks but also with Marco u see how Akainus magma splashes around, thus if not defended against with Haki it would DEFINATELY continue its path vs Shanks IF ONLY Shanks' sword were the reason why Shanks was able to defend against Magma/Akainu, that for me makes it highly likely that it is indeed Shanks' haki, which shields him from Akainus attack, so ur statement the sword is the reason for it is pretty much disproven for me, because Marco does not use a sword, yet he blocks Akainu pretty similar (talking about how the endresult is pictured, not how it's done, since sword defense =/= foot defense) to how Shanks does it. Why u ask, because just like the magma that splashes around when Marco defs, exactly that magma would not splash around 90° but move straight ahead to Shanks, since his sword would only protect Shanks at the face it connects to the magma, the rest would simply continue to flow toward Shanks. And the part with being caught of guard is not valid enough for me too (in the sense we r discussing here) since just like with Shanks he was also caught of guard by Marco yet the magma still splashed. To bolded: Thats what i am unsure of myself, since post TS is done differently,or rather say the frequency of the usages are extremely different imo. But when it comes to ur argument that its not a shield, i would say the exact opposite (talking about the invisible arnament, which was why i said before Shanks, Ray-san use haki different from how Luffy does). To me the way Ray-san explained it its exactly that. He even talks about armor. The difference is that Shanks, Marco and Ray san generate that armor NOT ON their body like Luffy does, but on an area they choose. That would also explain why Sentomaru and the Boa sisters had a "visual shield" that was greater than the point the attack Luffy used connected to, just as Ray-sans shield is greater than his hand, and just as Shanks shield is protecting him from a greater AOE that his sword has a face to protect him from, since Sakas fist is clearly far bigger than the connecting surface he has with the sword, and because without a bigger AOE the "fluid magma" would still continue its path like presented before. But as i said, its just how i understand it, u might be right and i misunderstand the visuals given, but so far i still think that it is the way i think it is, otherwise especially Ray-san haki explanation would need to be disregarded on a too big scale for even Oda, who did it with certain intent, to justify. sry but i am a bit confused with the coloured part, since i am unsure what exactly u try to point out with this. Edited by capu, 09 October 2018 - 02:24 AM.